Th e Adrenaline Rush inflatable obstacle course, offers six different combinations of challenges that are set up parallel to each other. Starting on the left and right sides, competitors race through, starting with the log obstacles, up a rock climb, down a slide and then crawl through the tubes. Then they turn to the center of the obstacle course, and race through the pop up obstacles and climb the even higher rock climbing wall then slide down to the finish. 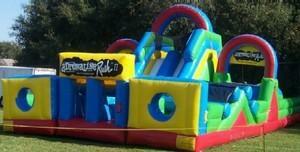 The bright and colorful Adrenaline Rush obstacle course is sure to be a big hit at your next event!